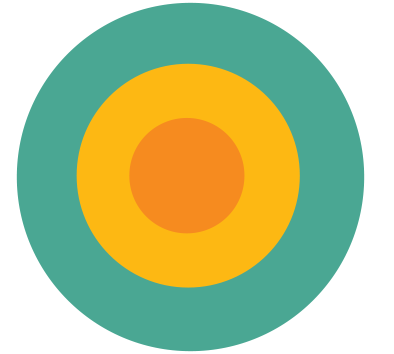 Eliya known as brightness or into the light is another project formulated by one of the power hungry, greedy, corrupted clan of the Rajapakses’. This project in which Mr. Gotabaya Rajapakse is presented as the only leader who can save Sri Lanka, have formulated a plan in dividing communities inside and outside of Sri Lanka. However their plan to launch Eliya in London was a major failure. Organisers were forced to cancel the initial venue where the launch was supposed to take place. 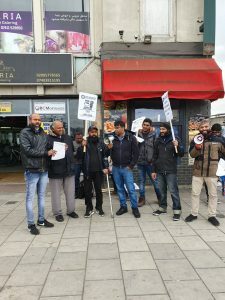 The school venue received many complaints from Sinhala and Tamils living in London who did not want to identify themselves with a racist organisation. This was a big blow to the organisers who were oblivious to the mood and stance of the diaspora. It did not stop the Eliya coordinators who framed all Sinhala people who made the complaint as Sinhala tigers working against them. This is the approach they have taken to counter anyone who oppose their divisive ideology. Those who oppose them are dubbed terrorists regardless of whether they are Tamils, Muslims or Sinhalese. They overcame the set back they faced with regards to a venue, by using their connection. Tamil Solidarity immediately called a protest. 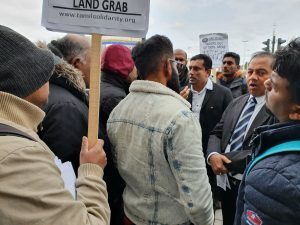 More than 100 protesters turned up outside the venue an hour before Eliya’s launch. 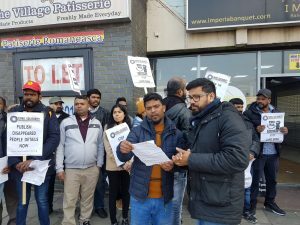 As the activists stood outside with leaflets and placards. 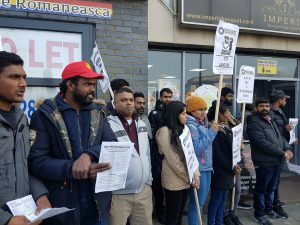 Eliya had other problems to worry about.For hours their meeting room remained empty, leaving disgruntled organisers of the event coming out and taking pictures and video blogs of the protesters.This is a tried and tested tactic of the GOSL. 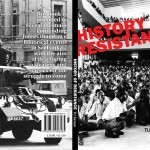 It was nothing but an attempt in intimidating the activists and protesters of Tamil Solidarity. When that failed they began small talk with the key activists whilst their colleagues were busy taking video evidence of the conversations. It was clear that they could not mobilise their support for this quite racist and divisive endeavour masterminded by none other than Gotabaya Rajapakse. The knack these officials have for taking pictures outweighed their organisation skills. As the few who turned up, it was clear what kind of individuals that turned up at this event. These individuals were army commanders and officers linked to the GOSL. Some of them are still linked with the embassy. Yet they struggled with their numbers even though almost all of them had brought their families including children as young as five.This in all honesty was not a political meeting instead a friends and family get together of the GOSL and the Sri Lankan military. It also has to be noted that this was not a London event. Attendee’s arrived as far as from Birmingham, Liverpool, and Coventry. 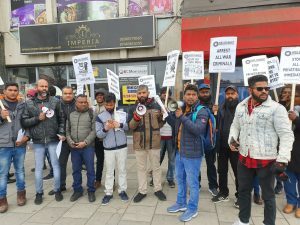 Members from Sri Lanka Podujana Peramuna (Sri Lanka National Front) (SLPP) living all over the country were mobilised. Even then they did not get enough numbers. It is therefore apparent that the SLPP or Gotabaya Rajapakse do not have any solid support in the Sinhala community and they do not have the ability to organise Sinhala workers and youth living in this country. To state explicitly, their politics has no foundation whatsoever and this launch is nothing short of a gross failure. 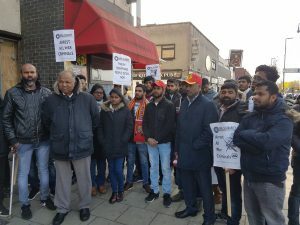 Despite the resources at their disposal, plus all their links with the embassy and going as far as flying in their leading politicians from Sri Lanka, this event failed to interest the Sri Lankan community living in the UK, which can only mean a failed attempt by the organisers of Eliya. 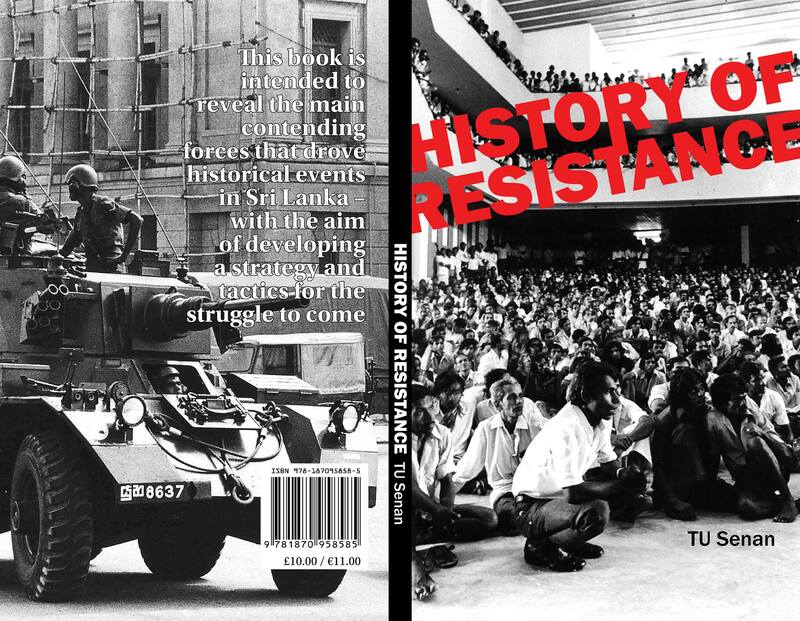 Activists played a huge role in advising those attending the events by issuing leaflets against the Eliya program whilst others voiced out the demands let out by TS such as stop all privatisation immediately, free health care and education for all, all occupied land in the North and East must be released immediately, all political prisoners must be released immediately, publish forcefully disappeared people’s details, all war criminals must be arrested immediately and for the right to self-determination of tamils. 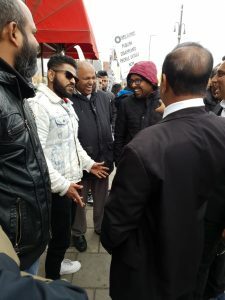 The protesters raised their disgust about the Priyanka Fernando incident. 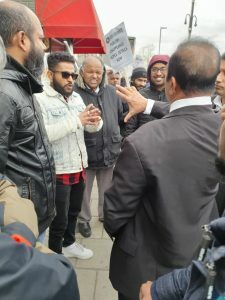 The exchange had heated up near the entrance whilst another retired Sri Lankan official went on to state that the Tamils are fighting a lost cause and was very dismissive when approached by a key activist in asking for further explanation to the phrase of “lost cause”. 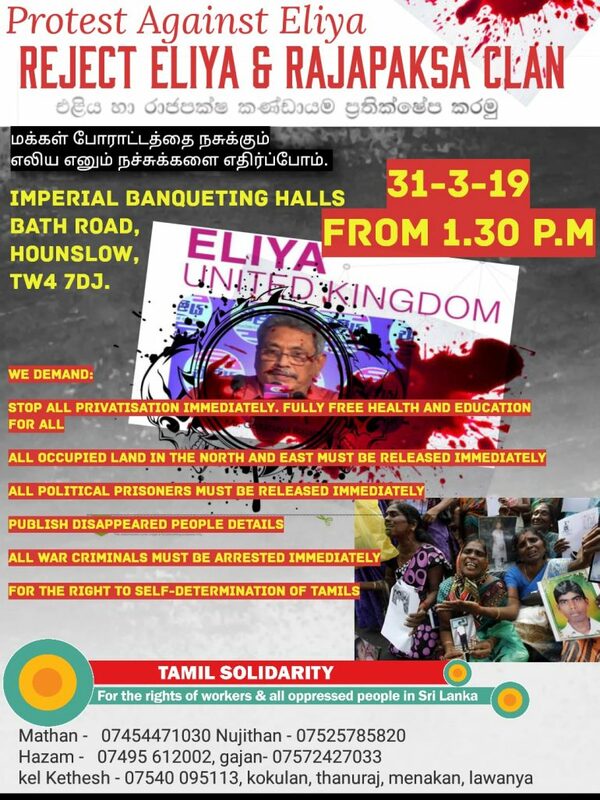 A few journalists who went into this meeting were able to gather that the whole Eliya program seemed like white washing the crimes of Gotabaya and then looking up to him as the messiah that would deliver for Sri Lanka. They framed all protesters and activists outside the venue protesting as terrorists. Apart from initial remarks the whole meeting was held in Sinhala language; When questioned some admitted to the protesters that the meeting was only for Sinhala people, despite them pretending to represent all. Finally all this charade only points to one obvious fact. Presidential elections are right around the corner and it is Eliya’s function to promote Gotabaya Rajapakse. This program is certainly not for the betterment of the most oppressed and vulnerable in Sri Lanka but a sorry attempt in pulling the wool over the eyes of the Sri Lankan community living abroad and thus portray Gotabaya Rajapakse as the solution to all problems. 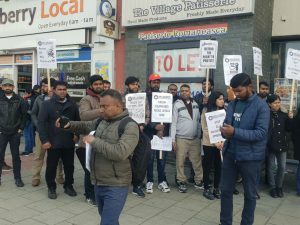 Tamil Solidarity will continue to work to stop such a racist organisation put foot in Britain.